In a business, inputs come in, products are made and then shipped out, and only through an inventory software can you keep track of all these movements. It is impossible to know exactly where something is within a complex business operation. An inventory management software allows a manager, executive or an owner to know exactly what is on hand, where it is in use, and to what finished product everything results in. Business is a constant flow and an inventory software provides a snapshot of this flow at any given time. 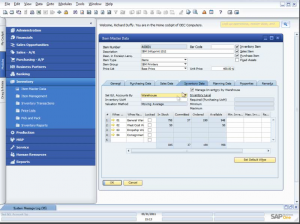 The inventory software also prevents inefficiency by indicating where units are too many or too few. As a result, incurring additional costs of keeping the number or units to the ideal level – dealing with excesses and deficits – is prevented using a good inventory software. The business books tell us that there are three key aspects of any inventory. Any inventory system software must be able to deliver on these key aspects. First, time. This means that the company should at all times know how long it takes for a supplier to process orders and execute deliveries. It should also be able to know the length of time it will take for those materials to get out of the inventory. If the company knows these things, it will be able to know just when it should place an order, and how many units should be ordered, so that everything runs smoothly. Time is also important in knowing how long it takes for the raw materials to be processed into the finished product. The inventory software should be able to provide this information at all times. on time. A good inventory software will help identify how many of which units are needed to maintain a smooth flow. Finally, an ideal inventory software should be able to keep a record of the finished goods that are ready to be shipped out of company premises. Managing inventories is tricky. Executives and managers, no matter how familiar they are with the company’s operations, will not be able to make decisions regarding their inventory with precision without the help of an inventory software. It gives them a perspective and a knowledge that is impossible to attain through manual means. A mismanaged inventory, whether there is a glut or a shortage, can create financial problems for a company. In the end, customers will be dissatisfied, additional costs will be incurred and physical stock either piles up or thins out to the detriment of the organization. Any business therefore that deals with physical input and output must have a sound inventory software in place.